Jamie Oliver wants to change the way kids think about and eat their food. 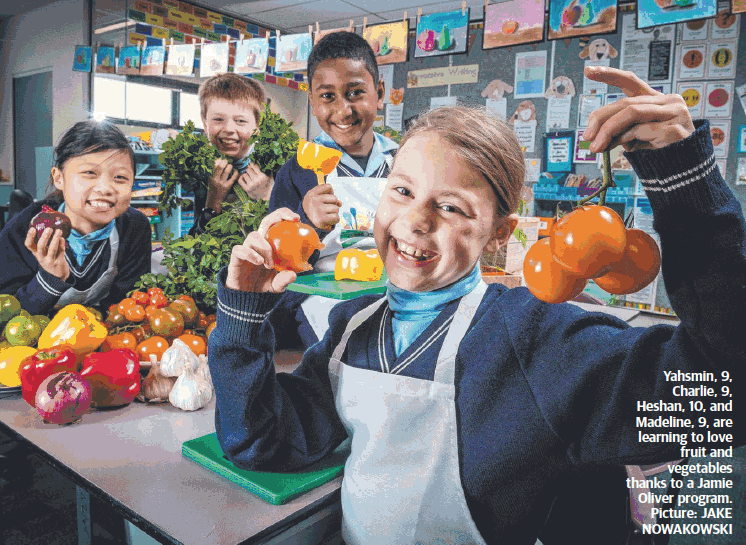 The celebrity chef’s Learn Your Fruit and Veg program, which has been running in the UK since 2012, is now in Australian primary schools and early learning centres. Students who complete the program are able to follow and prepare recipes with fresh, healthy produce. “At its simplest, Learn Your Fruit and Veg is about celebrating fresh produce and all the delicious things you can make,” Oliver said. The program comes as research commissioned by The Good Foundation found 71 per cent of kids aged 3-17 were not eating the daily recommended intake of fruit and vegetables. A pilot program at Sacred Heart School in Kew began this year. Grade 4 student Charlie, said he had fun during the lessons. “We were able to take our dishes home to share with our family but it was so delicious that we ate it ourselves,” he said.